Sid Cottingham, Keith McCants and I are three conservative Democrats who blog about politics in the state of Georgia. While I can't speak for Sid or Keith, sometimes it feels lonely being a Democrat who believes the President can best serve the state Democratic Party by staying out of Georgia; thinks the balanced budget amendment to the U.S. Constitution is an idea with merits; and believes that once the government has paid its bills and puts a certain amount of money away for a rainy day, any surplus tax dollars should be returned to the taxpayers. There can be little doubt that the leadership of the Democratic Party is dominated by liberals. 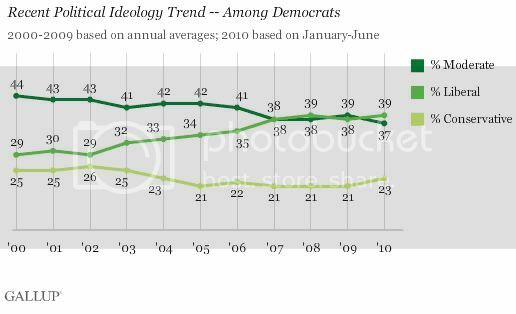 However, a new Gallup poll strongly suggests that most Democrats consider themselves conservative or moderate. Overall, the poll says, 42% of Americans describe themselves as "either very conservative or conservative" [Saad, Lydia (2010-6-25). In 2010, Conservatives Still Outnumber Moderates, Liberals. Gallup. Retrieved on 2010-6-26.]. With these new numbers, being a conservative Democrat doesn't seem all that lonely anymore. The country is conservative. Most of the Democratic Party is either moderate or conservative. Now the task is to get the leadership to reflect both the country and the Party.